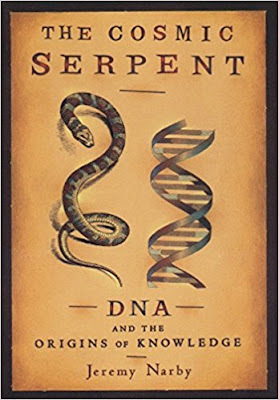 Book Review: "The Cosmic Serpent: DNA and the Origins of Knowledge"
While I was on my honeymoon earlier this month at Cape May, I brought along a book to read on the beach that as been in my queue for awhile. 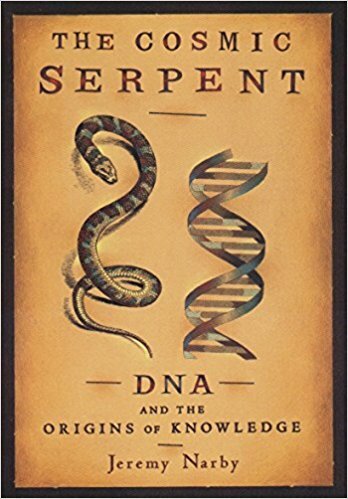 "The Cosmic Serpent: DNA and the Origins of Knowledge"
The author Jeremy Narby begins the book with the mystery of ayahuasca- a powerful psychedelic brew originating from the jungles of The Amazon in South America. This botanical, mind & soul-altering concoction is created from a combination of the Banisteriopsis caapi vine, which contains several alkaloids that act as monoamine oxidase inhibitors (MAOIs). The other ingredient, a shrub Psychotria viridis, contains the primary psychoactive compound, dimethyltryptamine (DMT). The MAOIs from the B. cappi are required for DMT of the P. viridis to be orally active & produce the visionary experience. The question that has presented itself is- how did the indigenous tribes know how to combine these two plants, out of thousands in the jungle, to create a specific chemical reaction to create the desired effect? The ayahuascero shamans claim that the plants themselves revealed this truth to their ancestors. This idea of some kind of intelligence in the plant relaying this information creates another question- one that is the main premise of this book: Can ALL life communicate on levels (down the cellular and molecular scale) that science might not be currently aware of, & that does not involve the use of symbolic language that we humans are familiar with? Could the DNA molecule itself, besides being an encoder of information, also be capable of communicating and transmitting information, even perhaps somehow into the level of consciousness? In ayahuasca trances, glowing, vibrating snakes and serpents imparting knowledge are a common motif. The author investigates whether these might be visualizations of the continually pulsating, light-emitting DNA strands themselves, somehow communicating information to the emergent neurological phenomenon that we recognize as the human mind. Perhaps it also goes the other way, and our mind when unlocked in a certain manner can be transported down to directly interact and perceive at the scale of cells and molecules. The Newtonian mechanistic view of the Universe, especially when it comes to life, is completely inadequate for having a true, holistic view of the world. However despite the awe-inspiring intricacy of life at the microscopic scale & weirdness of phenomena at the quantum level, science still has trouble grasping with the ephemeral nature of mind and consciousness as anything other than brain activity. This is understandable, since it is hard to quantify the idea of a universal consciousness, patterns of coherent energetic information transmission that exist EVERYWHERE- pervading all aspects of this Universe, at all scales.. This is the axis mundi that I have already mentally traveled up and down many times, and was guided through once again by the author as he connected the systems & processes of life from the microcosm to the macrocosm. Underlying this quest that the author has written about, is the idea that the wisdom and traditions of native people should be preserved along with their land & environment. The profit-driven juggernaut we call the pharmaceutical industry cannot be allowed to exploit healing knowledge and plants that exist for the benefit of everyone. Although science should have the freedom to learn and understand as much of our reality as possible, that knowledge should not be used to restrict and refine discovery for the selfish gain of soulless megacorporations. I enjoyed reading The Cosmic Serpent, and it was the perfect mix of science and mysticism for a syncretist such as myself. It made me think deeply about biology, spirituality, ecology, anthropology, and the complexity of life & reality itself. It was a relatively short book, but full of mind-expanding insights and information that I'd highly recommend. This month, my family went on their annual trip to the Poconos in Pennsylvania. We went the week after my wife and I got back from our wedding & honeymoon. It turned out to be a nice week overall, a chance to to sit by the lake & read or relax, go out on the boats, fish, and just enjoy the outdoors & each other. We got the fire pit going at night and sat under the stars, listening to the sounds of fish, frogs, and insects on the dark, still water. My family really values this time we spend on vacation, and it is the source of many great memories for us, and now for the younger generation represented by my sister's kids. I uploaded photos to an album with pics of some of the fun we had and the natural sights we experienced. I saw some interesting wildlife- including a northern water snake that periodically swims by the dock, & also a spider wrapping up a beetle in a cocoon. I actually have videos of both of these that I will upload soon. My brother grilled two nights in a row, as the rest of us chipped in meat and assistance to create the family-sized feasts. We hiked Davis Trail near Scranton, PA one day. We decided to all go off the trail and hike through the gorge to be closer to the beauty of the river, soiled only by dirtbag visitors who have left trash in certain areas. I saw this miniature spider on my car, and used my macro lens to get a closeup photo. I love getting a more detailed view of the life all around us, but beneath our threshold of perception. The spider was green, and it was so small that it was translucent! It's 4 front legs were longer than its back legs, & it had eyes that were black points smaller than a grain of sand. Last weekend, I went to see "Solo: A Star Wars Story" while it was still in the movie theaters. I have been preoccupied with work & the process of getting married, so I hadn't seen it yet. Han Solo was never one of my favorite characters, and I didn't think the actor Alden Ehrenreich looked nothing like a young Harrison Ford, so at first I wasn't too interested in seeing it, despite my love for everything Star Wars. However, I started seeing positive reviews from people who had seen it & were pleasantly surprised. So, I decided to check it out & I'm glad I did. 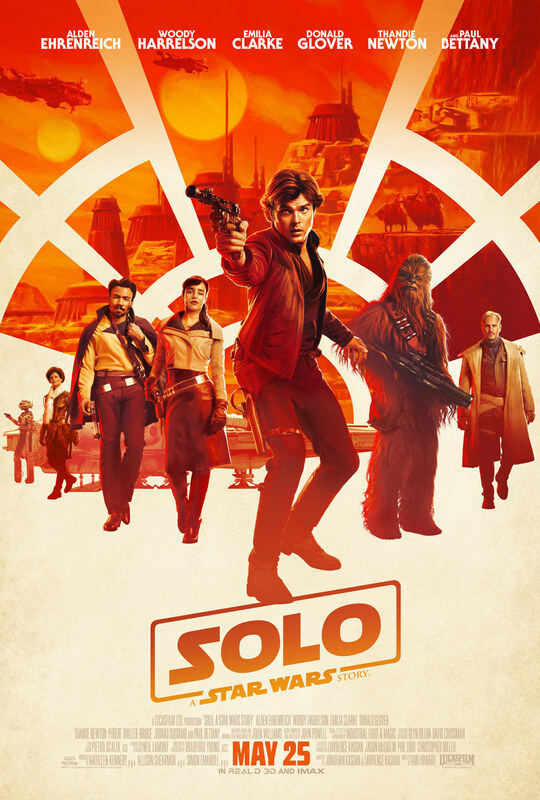 It was an action-packed "heist"-type film in which Han joins a group of smugglers trying to steal a large quantity of hyperspace fuel to pay back their debts. Early on, Han escapes his home planet of Corellia and becomes part of the Imperial infantry, where he meets Chewbacca. This was all part of the Han Solo backstory before, and I think it was fleshed-out pretty well. In my opinion, this was actually more of a "Star Wars" movie than The Last Jedi. There were more exotic planets and locations, both new & familiar aliens, a more coherent & interesting storyline, and less eye-rollingly bad attempts at humor. The amount of screen time given to Chewie was cool, but hands-down the best aspect of the movie was Donald Glover as young Lando. Even from the first time you hear his voice off-camera, it sounds just like Billy Dee Williams. He had all the mannerisms & inflections down perfectly. Alden Ehrenreich was close enough to the Han we all know to let me suspend my disbelief. However, after seeing a reference to Anthony Ingruber as a young Harrison Ford, I thought that he would have been a far better casting choice. All-in-all the casting was good, and it didn't interfere with my enjoyment of the movie too much. There were some great cameos and easter eggs for Star Wars fans (that I'm not going to spoil here). I'm glad I got to see it in the theater, where the awesome visuals really make an impact. I would definitely recommend it, especially to Star Wars fans like myself. As I said, Han Solo was never a character I really liked, but this movie managed to make his backstory interesting and fun to watch. It follows Rogue One as another well-done Star Wars Story. I recently finished reading the biography of one of history's greatest geniuses, and a personal icon of mine, Leonardo da Vinci. Leonardo is probably the person who I have read & researched more than anyone. I wrote my first book report on him in grade school, and his brilliance has inspired me ever since. He is the epitome of knowledge, wisdom, and deep insight into the nature of reality. I have read many books about Leonardo, and I also created a game that's connected to his art & studies regarding sacred geometry, called "Da Vinci's Challenge". 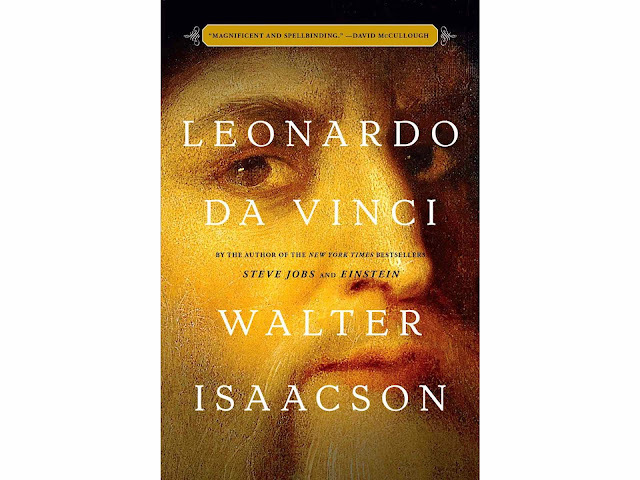 Despite having read so much about this amazing man, the book by Walter Isaacson was still as fascinating and engaging as if it was the first time hearing about him. He weaved a narrative about Leonardo that made me feel like I had an even clearer glimpse into his remarkable life. When you really take a look at the totality of da Vinci's work, there are countless discoveries he made outside the realm of the fine arts that just defy belief. For instance, his realization that the aortic valve in the heart opened & closed based on the characteristics of turbulent flow, not just back pressure on the valve, is a triumph of observation and correlation. This is just one revolutionary insight, in just one of the many areas of study that he immersed himself in. His notebooks are a treasure trove of intellectual investigations. So much has been written about this original "Renaissance Man", so I will just say that if you are remotely interested in the life and work of Leonardo da Vinci, this a book you definitely want to make the time to read. My last post was right after the private, legal marriage ceremony to my wonderful wife, Loretta. Last weekend, we had our public wedding ceremony & reception for family and friends at The Old Mill in Rose Valley, PA.
We had been planning the wedding for a year, with the help of our awesome parents. We had a vision for what we wanted, & all our hard work paid off. 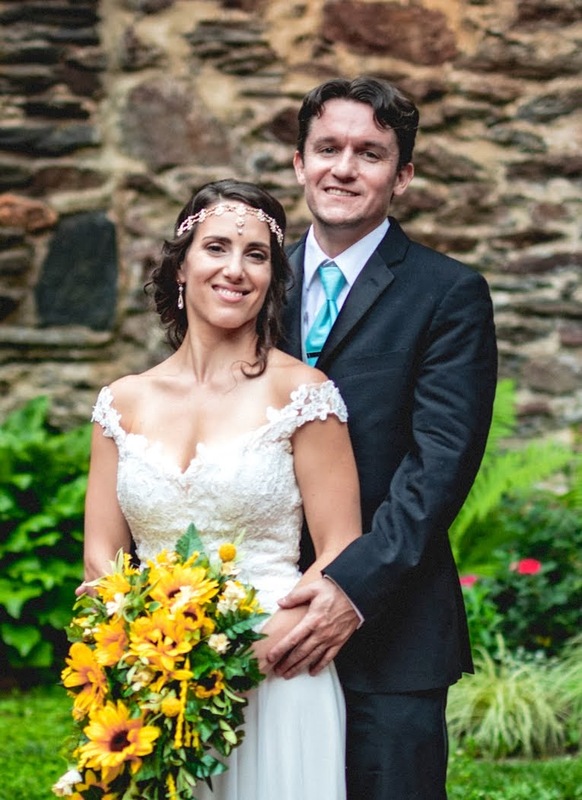 We both wanted a nature-themed wedding, with an outdoor ceremony. I love the outdoors, and Loretta shares this affinity for the natural world with me. The whole day went absolutely perfect. Everything looked great, the decor that we created and ordered was exactly what we envisioned, the music was all our choices, our ceremony was beautiful, & most importantly, there was no major drama during the wedding! There were a few monkey wrenches thrown into the works, like the record 100º heat that was not the best conditions for a full tuxedo! It was also tough to realize I couldn't spend more time with all the people who came to be a part of this special moment. We had over 130 guests, and I did try to bounce around and talk to as many people as I could. It's impossible to have a long conversation with anyone, though. We wanted to start the night off with everyone hyped up, so after our slow dance ("And I Love Her" by The Beatles) we played "Turn Down for What" by Lil' Jon and got the whole room dancing right away. Everyone said they had a blast, and we had many people telling us it was the best wedding they'd ever been to, which is what we wanted people to experience. It is humbling to realize that there are so many people who I'm deeply connected with, and now that circle has grown with the people in Loretta's life. This past week, we were on our honeymoon in Cape May, where we stayed at an excellent bed & breakfast called Rhythm of The Sea. We sat on the beach & drank scotch, went out to eat every night, and had some much-needed rest & relaxation. This has been a time in my life that I am grateful to experience, and will never forget. I am married to an exceptional woman, who I've know for many years & consider my best friend. The wedding was our way to publicly express and spiritually symbolize the love that connects us.